The FBI has opened an investigation into the lecherous Harvey Weinstein, the UK Daily Mail reported on Wednesday. It is said that they had two immediate concerns. The first concern was that he would pull a “Roman Polanski” and leave the country to avoid the consequences. Those fears were relieved after Weinstein decided to go to a rehab center in Arizona rather than one in France like he initially planned. The second fear is suicide. I doubt it, the man love himself too much, but of course his life is in shambles and his career is most likely over. The request for the investigation came from the Department of Justice but it won’t take long for liberals to blame it on Trump, saying he was behind it all. Perhaps the New York Times or CNN will run a story that Trump kidnapped him and convinced him to wage a nuclear war against Zimbabwe. Yeah, we’re just kidding, but you never know. Indeed, on Wednesday evening the NYPD confirmed that they had opened an investigation. The Special Victims Division has been ordered to ‘endeavor to identify and locate and interview any potential victims’ of the Oscar winning producer. ‘He’s a super predator. His conduct shows he’s been at this a long time, and he’s a professional at it,’ another police official said to the New York Post. Here is an interesting thought. Do you know who worked for Harvey Weinstein this past summer? Malia Obama. I wonder if he tried anything with her. I mean, it sounds like he has tried something with everyone else who has worked for him or who wanted to work for him. Then again, he might have had better sense than to try anything with the daughter of the former president. She has finally agreed to give the money he gave her to charity like everyone else but Obama did right after the story came out. So far about thirty women have come forward, including three who say he raped them. Obama has made no statement about returning all the money he got. 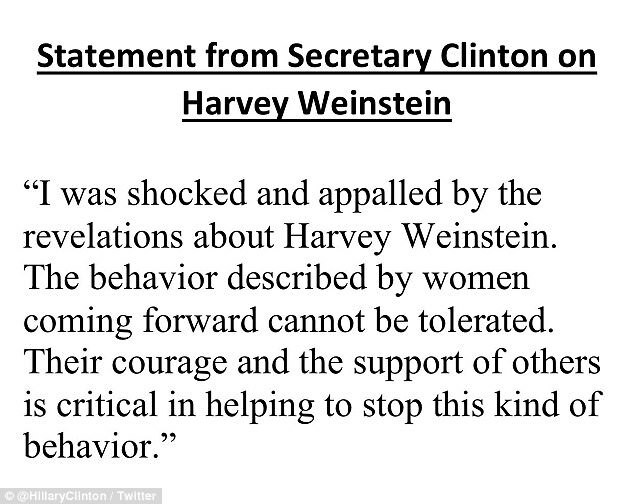 It appears that Weinstein counted on the fact that he was so powerful in the movie industry that women would be afraid to come out and accuse him. But once one woman did come forward, it was like a dam bursting.